Celebrity Dentist and Businesswoman Dr. Emily Letran, has just been nationally featured for her excellence in dentistry and philanthropic community efforts in Southern California. Celebrity Dentist Emily Letran, is a sought after family and cosmetic dentists in Southern California, who has just been nationally featured in CBS Money Watch, The Los Angeles Daily News, and The San Francisco Chronicle. "Dr. Emily." as her patients affectionately refer to her, is also a best selling co-author of the book titled "Out Front: Business Building Strategies from Frontline Entrepreneurs." Out Front: Business Building Strategies from Frontline Entrepreneurs feature the country’s foremost business experts and thought leaders revealing their top secret break-through action plans. In it, readers will learn how to market their business in new innovative ways that will deliver revolutionary results. Most importantly, readers will find out how to put themselves “Out Front” - and make sure they stay there. As a dedicated patient advocate and champion for preserving the "human touch" in the dental healthcare profession, Celebrity Dentist Emily Letran was asked to contribute a touching story called “Priceless Smiles." It shows how discovering a deeper purpose for your business can unite your team and create lifetime fans. On the day of release, Out Front, reached best-seller status in five Amazon.com categories - The book reached best-seller status in the Direct Marketing, Environmental Economics, Marketing, Entrepreneurship, and Small Business & Entrepreneurship categories. As a dedicated contributor to her community, Dr. Letran annually provides over $27,000 in free dental services to those in need through her Free Day of Dentistry events, and most recently announced her support of The HOME Foundation's 2013 Dream Home Giveaway. As a mother of three, Dr. Letran creatively balances work, family life, after-school life and her personal life as a growing entrepreneur. She continuously takes courses in clinical dentistry, practice management and marketing, striving to improve her skills to better serve patients. Her favorite activities include reading, writing, and “hanging out” with her three children - whether playing tennis, watching Netflix or window-shopping at the mall. Dentist Emily Letran's has the unique ability to connected with her patients and calm the occasional extra nervous or anxious visitor. "We realize that even though dental care has come a long way in terms of patient comfort, there are still those with concerns and fears. Dental care should not be an unpleasant experience so we provide a full array of options for those patients. We offer several techniques to help you relax so please ask us about the different methods we offer," says Dr. Emily. The Helping Others Means Everything Foundation, or The HOME Foundation, is a not-for-profit organization dedicated to helping our Family of Charities. Frankie Verdugo, President of The HOME Foundation, wants to help as many worthy charities as possible as they struggle during these tough economic times. Frankie Verdugo helps raise funds through luxury dream home raffles, home giveaways, prizes, and high profile celebrity events in Hollywood... "Our mission is to help charities reach their fundraising goals and to bring awareness to their praiseworthy causes." Please visit our 2013 Dream Home Raffle Giveaway on http://www.facebook.com/HOMEFoundationRaffle. 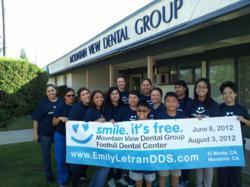 Celebrity Dentist Dr. Emily Letran and Tammy, a Happy Patient.